အာကာသယာဉ်သည် ကမ္ဘာကိုတစ်ကြိမ်တည်းသာပတ်ခဲ့သည်။ (to this date the shortest orbital manned spaceflight). တရားဝင်မှတ်တမ်းများအရ ယာဉ်စတင်ပစ်လွှတ်ချိန်မှပြန်လည်ဆင်းသက်ချိန်အထိ စုစုပေါင်း ၁၀၈ မိနစ်ကြာခဲ့သည်။ ဂါဂါရင်သည် ကြိုတင်စီစဉ်ထားသည့်အတိုင်း အမြင့် ၇ ကီလိုမီတာ(၂၃,၀၀၀ ပေ)ခန့်တွင် လေထီးဖြင့်ခုန်ထွက်ပြီး အာကာသယာဉ်မှသီးခြားဆင်းသက်ခဲ့သည်။ Due to the secrecy surrounding the Soviet space program at the time, many details of the spaceflight only came to light years later, and several details in the original press releases turned out to be false. ခရီးစဉ်တွင်မည်သူလိုက်ပါပျံသန်းမည် နောက်ဆုံးဆုံးဖြတ်ချက်မှာ နီကိုလိုင်ကမန်နင်( Nikolai Kamanin)ပေါ်လုံးဝမူတည်နေသည်။ ဧပြီ ၅ ရက်နေ့ဒိုင်ယာရီတွင် ကမန်နီက သူသည် ဂါဂါရင်နှင့်တီတော့ဗ် မည်သူ့ကိုရွေးရမည်ကိုမဆုံဖြတ်နိုင်သေးကြောင်းရေးသားထားသည်။  He wrote: "The only thing that keeps me from picking [Titov] is the need to have the stronger person for the one day flight." Kamanin was referring to the second mission, Vostok 2, which would last a full day, compared to the relatively short single-orbit mission of Vostok 1. ဂါဂါရင်နှင့်တီတော့ဗ်တို့အား ဧပြီ ၉ ရက်နေ့အစည်းအဝေးတွင် ဆုံးဖြတ်ချက်ကိုသိရှိစေခဲ့ရာ ဂါဂါရင်မှာများစွာဝမ်းမြောက်ခဲ့ပြီး တီတော့ဗ်မှာစိတ်ပျက်သွားခဲ့သည်။  On April 10, this meeting was reenacted in front of television cameras, so there would be official footage of the event. This included an acceptance speech by Gagarin. As an indication of the level of secrecy involved, one of the other cosmonaut candidates, Alexey Leonov, later recalled that he didn't know who was chosen for the mission until after the spaceflight had begun. ဂါဂါရင်သည် ပျံသန်းမှုမတိုင်မီ ဆရာဝန်အဖွဲ့နှင့်ဆေးစစ်ခြင်းခံယူရသည်။ One doctor gave her recollection of the events in an interview with RT in April 2011: "Gagarin looked more pale than usual. He was unsociable and quiet, which was not like him at all. He would answer by nodding or a short 'yes' to all questions. Sometimes he would start humming some tunes. This was a different Gagarin. We geared him up, and hugged. And I said, "Yuri, everything will be fine." And he nodded back." Because of weight constraints, there was no backup retrorocket engine. The spacecraft carried 10 days of provisions to allow for survival and natural decay of the orbit in the event the retrorockets failed. ခရီးစဉ်တစ်ခုလုံးကို အလိုအလျောက်ထိန်းချုပ်စနစ်ဖြင့် သို့မဟုတ်မြေပြင်စခန်းမှထိန်းချုပ်မည်ဖြစ်သည်။ This was because medical staff and spacecraft engineers were unsure how a human might react to weightlessness, and therefore it was decided to lock the pilot's manual controls. In an unusual move, a code to unlock the controls was placed in an onboard envelope, for Gagarin's use in case of emergency. :278 But prior to the flight, Kamanin told Gagarin the code anyway. ၁၉၆၁၊ ဧပြီ ၁၁ မနက်၌ ဘီကိုနာအာကာသလွှတ်တင်ရေးစခန်းတွင် ဗော့စတော့-ကေ ဒုံးပျံ သည် ဗော့စတော့ ၃ ကေအေ အာကာသယာဉ်တွဲလျက်သားဖြင့် ပစ်စင်ဆီသို့ မိုင်ပေါင်းများစွာအဝေးမှ ရေပြင်ညီအနေအထားဖြင့်သယ်လာကြသည်။ ပစ်စင်သို့ရောက်ရှိချိန်တွင် ဆာဂေးကိုရိုလက်ဗ်ကဒုံးပျံနှင့်အာကာသယာဉ်ကို စစ်ဆေးသည်။ ထူးခြားမှုမတွေ့ရသဖြင့် ဒုံးပျံအားထောင်လိုက်သည်။  At 10 am (Moscow Time), Gagarin and Titov were given a final review of the flight plan. They were informed that launch was scheduled to occur at 9:07 am Moscow Time. This time was chosen so that when the spacecraft started to fly over Africa, which was when the retrorockets would need to fire for reentry, the solar illumination would be ideal for the orientation system's sensors. At 6 pm, once various physiological readings had been taken, the doctors instructed the cosmonauts not to discuss the upcoming missions. That evening Gagarin and Titov relaxed by listening to music, playing pool, and chatting about their childhoods. At 9:50 pm, both men were offered sleeping pills, to ensure a good night's sleep, but they both declined. Physicians had attached sensors to the cosmonauts, to monitor their condition throughout the night, and they believed that both had slept well. Gagarin's biographers Doran and Bizony say that neither Gagarin nor Titov slept that night. Korolev didn't sleep that night, due to anxiety caused by the imminent spaceflight. မော်စကိုစံတော်ချိန် နံနက် ၅:၃၀ တွင် ဂါဂါရင်နှင့်အရံလူ တီတော့ဗ်တို့အားနှိုးကြသည်။  They were given breakfast, assisted into their spacesuits, and then were transported to the launch pad. ဂါဂါရင်သည် ဗော့စတော့ ၁ အာကာသယာဉ်ထဲသို့ဝင်ရောက်ပြီးနောက် ဒေသစံတော်ချိန် ၇:၁၀(နိုင်ငံတကာစံတော်ချိန် ၀၄:၁၀)တွင် ရေဒီယိုဆက်သွယ်မှုစနစ်စတင်သည်။  ဂါဂါရင် ဗော့စတော့ ၁ အာကာသယာဉ်ထဲသို့ထပ်မံဝင်ရောက်ပြီးနောက် အာကာသယာဉ်မောင်းခန်းကင်မရာနှင့်ဆက်ထားသော ထိန်းချုပ်ခန်းရှိ ရုပ်မြင်သံကြားမြင်ကွင်းတွင် ဂါဂါရင်၏ရုပ်ပုံပေါ်လာသည်။ နောက်ထပ် ၂ နာရီကြာသည့်တိုင် လွှတ်တင်ခြင်းမပြုသေးပေ။ ထိုအတောအတွင်း ဂါဂါရင်သည် ယာဉ်ဆက်သွယ်ရေးအရာရှိ၊ ဒီဇိုင်းအင်ဂျင်နီယာချုပ် ဆာဂေကိုရိုလက်ဗ်၊ နီကိုလိုင်ကမန်နင်၊ အခြားသူအနည်းငယ်တို့နှင့်စကားလက်ဆုံကျနေသည်။  စမ်းသပ်စစ်ဆေးမှုတွဲပြီးဆုံးပြီးနောက် ဂါဂါရင် ယာဉ်ထဲဝင်ရောက်ပြီး မိနစ် ၄၀ အကြာတွင် ဂယ်ပေါက်ကိုပိတ်လိုက်သည်။ အဆို့မလုံကြောင်းတွေ့ရသဖြင့် စက်ပိုင်းပညာရှင်များသည် ဝက်အူတိုင်များဖြုတ်ချပြီး ဂယ်ပေါက်ကိုထပ်မံဆို့ရသည်။. ထိုအတောအတွင်း ဂါဂါရင်က ရေဒီယိုမှသီချင်းဖွင့်ပေးရန်တောင်းဆိုသည်။  Sergei Korolev was very nervous in the lead up to the launch; he experienced chest pains, and took a pill to calm his heart. Gagarin, on the other hand, was described as calm; about half an hour before launch his pulse was recorded at 64 beats per minute. 06:07 UT Launch occurs from the Baikonur Cosmodrome Site No.1. Korolev radioed, "Preliminary stage..... intermediate..... main..... LIFT OFF! We wish you a good flight. Everything is all right." Gagarin replied, "Поехали! (Here we go!)." 06:13 UT The rocket is still firing, pushing Vostok 1 toward orbit. Gagarin reports, "...the flight is continuing well. I can see the Earth. The visibility is good.... I almost see everything. There's a certain amount of space under cumulus cloud cover. I continue the flight, everything is good." 06:14 UT The rocket continues to fire, starting to pass over central Russia. Gagarin reports, "Everything is working very well. All systems are working. Let's keep going!" 06:15 UT Three minutes into the burn of the final rocket stage and Gagarin reports, "Zarya-1, Zarya-1, I can't hear you very well. I feel fine. I'm in good spirits. 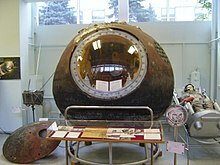 I'm continuing the flight..." Vostok 1 is moving further downrange from the Baikonur Cosmodrome. He is reporting back to Zarya-1 (the Baikonur ground station) and must be starting to move out of radio range of that station. Ground controllers did not know if a stable orbit had been achieved until 25 minutes after launch. 06:17 UT The Vostok rocket final stage shuts down, ten seconds later the spacecraft separates and Vostok 1 reaches orbit. (T+ 676 s) Gagarin reports, "The craft is operating normally. I can see Earth in the view port of the Vzor. Everything is proceeding as planned". Vostok 1 passes over Soviet Union and moves on over Siberia. 06:21 UT တွင် ဗော့စတော့ ၁ သည် ကမ်ချက်ကားကျွန်းဆွယ်(Kamchatka peninsula)ပေါ်ဖြတ်ကျော်သွားပြီး and out over the North Pacific Ocean. Gagarin radios, "...the lights are on on the descent mode monitor. I'm feeling fine, and I'm in good spirits. Cockpit parameters: pressure 1; humidity 65; temperature 20; pressure in the compartment 1; first automatic 155; second automatic 155; pressure in the retro-rocket system 320 atmospheres...."
06:25 UT As Vostok 1 begins its diagonal crossing of the Pacific Ocean from Kamchatka peninsula to the southern tip of South America, Gagarin asks, "What can you tell me about the flight? What can you tell me?". He is requesting information about his orbital parameters. The ground station at Khabarovsk reports back, "There are no instructions from No. 20 (Sergey Korolyov), and the flight is proceeding normally" They are telling Gagarin that they don't have his orbital parameters yet because the spacecraft has been in orbit for only 6 minutes, but the spacecraft systems are performing well. 06:31 UT Gagarin transmits to the Khabarovsk ground station, "I feel splendid, very well, very well, very well. Give me some results on the flight!". Vostok 1 is nearing the VHF radio horizon for Khabarovsk and they respond, "Repeat. I can't hear you very well". Gagarin transmits again, "I feel very good. Give me your data on the flight!" Vostok 1 passes out of VHF range of the Khabarovsk ground station and contact is lost. 06:37 UT Vostok 1 continues on its journey as the Sun sets over the North Pacific. Gagarin crosses into night, northwest of the Hawaiian Islands. Out of VHF range with ground stations, communications must now take place via HF radio. 06:46 UT Khabarovsk ground station sends the message "KK" via telegraph (on HF radio to Vostok 1). This message means, "Report the monitoring of commands." They were asking Gagarin to report when the spacecraft automated descent system had received its instructions from the ground control. Gagarin reported back at 06:48 UT. 06:48 UT Vostok 1 crosses the equator at about 170° West, traveling in a south east direction and begins crossing the South Pacific. Gagarin transmits over HF radio, "I am transmitting the regular report message: 9 hours 48 minutes (Moscow Time), the flight is proceeding successfully. Spusk-1 is operating normally. The mobile index of the descent mode monitor is moving. Pressure in the cockpit is 1; humidity 65; temperature 20; pressure in the compartment 1.2 ... Manual 150; First automatic 155; second automatic 155; retro rocket system tanks 320 atmospheres. I feel fine...."
06:49 UT Gagarin reports he is on the night side of the Earth. 06:51 UT Gagarin reports the sun-seeking attitude control system has been switched on. The sun-seeking attitude control system is used to orient Vostok 1 for retrofire. The automated orientation system consisted of two redundant systems: an automatic/solar orientation system and a manual/visual orientation system. Either system could operate the two redundant cold nitrogen gas thruster systems, each with ၁၀ kg (၂၂ lb) of gas. 06:53 UT The Khabarovsk ground station sends Gagarin the following message via HF radio, "By order of No.33 (General Nikolai Kamanin) the transmitters have been switched on, and we are transmitting this: the flight is proceeding as planned and the orbit is as calculated." They tell Gagarin that Vostok 1 is in a stable orbit. He acknowledges the message. 06:57 UT Vostok 1 is over the South Pacific between New Zealand and Chile when Gagarin sends this message, "...I'm continuing the flight, and I'm over America. I transmitted the telegraph signal "ON". 07:00 UT Vostok 1 crosses the Strait of Magellan at the tip of South America. News of the Vostok 1 mission is broadcast on Radio Moscow. Path of Gagarin's complete orbit; the landing point is west of the takeoff point because of the eastward rotation of the Earth. 07:04 UT Gagarin sends spacecraft status message, similar to the one sent at 06:48. The message is not received by ground stations. 07:09 UT Gagarin sends spacecraft status message, the message is not received by ground stations. 07:10 UT Passing over the South Atlantic, the Sun rises and Vostok 1 is in daylight again. Vostok 1 is 15 minutes from retrofire. 07:13 UT Gagarin sends spacecraft status message, similar to the one sent at 06:48. Moscow picks up this partial message from Gagarin, "I read you well. The flight is going...."
07:18 UT Gagarin sends spacecraft status message, the message is not received by ground stations. 07:23 UT Gagarin sends spacecraft status message, the message is not received by ground stations. The automatic system brought Vostok 1 into alignment for retrofire about 1-hour into the flight. At 07:25 UT, the spacecraft's automatic systems brought it into the required attitude (orientation) for the reentry engine firing, and shortly afterwards, the engine firing occurred, also known as retrofire. This took place over the west coast of Africa, near Angola, about ၈,၀၀၀ km (၅,၀၀၀ mi) from the desired landing point. The liquid-fueled retrorockets fired for about 42 seconds. Ten seconds after retrofire, commands were sent to separate the Vostok service module from the reentry module (sharik), but the Vostok equipment module unexpectedly remained attached to the reentry module by a bundle of wires. At around 07:35 UT, the two halves of the spacecraft begin reentry and went through strong gyrations as Vostok 1 neared Egypt. At this point the wires broke, the two modules separated, and the descent module settled into the proper reentry attitude. Gagarin telegraphed "Everything is OK" despite continuing gyrations; he later reported that he did not want to "make noise" as he had (correctly) reasoned that the gyrations did not endanger the mission (and were apparently caused by the spherical shape of the reentry module). 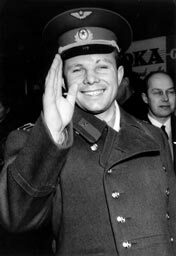 As Gagarin continued his descent, he experienced about 8 g (Gagarin's own report states "over 10 g") during reentry but remained conscious. In case of reentry engine malfunction, the spacecraft was designed to descend within 10 days due to orbital decay. However, the actual orbit differed from the planned and would not have allowed descent until 20 days postlaunch while the life support system was designed to function for only 10 days. At 07:55 UT, when Vostok 1 was still 7 km from the ground, the hatch of the spacecraft was released, and two seconds later Gagarin was ejected. At ၂.၅ km (၈,၂၀၀ ft) altitude, the main parachute was deployed from the Vostok spacecraft. Two schoolgirls witnessed the Vostok landing and described the scene: "It was a huge ball, about two or three metres high. It fell, then it bounced and then it fell again. There was a huge hole where it hit the first time." ဂါဂါရင်၏လေထီးချက်ချင်းပွင့်သွားပြီးနောက် ၁၀ မိနစ်အကြာ နိုင်ငံတကာစံတော်ချိန် 08:05 တွင် ဂါဂါရင်မြေပြင်ဆင်းသက်နိုင်ခဲ့သည်။ ဂါဂါရင်ရောအာကာသယာဉ်ပါ ၂၆ km (၁၆ mi) south west of Engels, in the Saratov region at 51°16′14″N 45°59′50″E﻿ / ﻿51.270682°N 45.99727°E﻿ / 51.270682; 45.99727လေထီးဖြင့်ဆင်းသက်လာကြခြင်းဖြစ်သည်။ . It was 280 km to the west of the planned landing site (near Baikonur). Prime Minister Jawaharlal Nehru of India praised the Soviets for "a great victory of man over the forces of nature" and urged that it be "considered as a victory for peace." The Economist voiced worries that orbital platforms might be used for surprise nuclear attacks. The Svenska Dagbladet in Sweden chided "free countries" for "splitting up and frittering away" their resources, while West Germany's Die Welt argued that America had the resources to have sent a man into space first but was beaten by Soviet purposefulness. Japan's Yomiuri Shimbun urged "that both the United States and the Soviet Union should use their new knowledge and techniques for the good of mankind," and Egypt's Akhbar El Yom likewise expressed hopes that the cold war would "turn into a peaceful race in infinite space" and turn away from armed conflicts such as the Laotian Civil War. When Soviet officials filled out the FAI papers to register the flight of Vostok 1, they stated that the launch site was Baykonur at 47°22′00″N 65°29′00″E﻿ / ﻿47.36667°N 65.48333°E﻿ / 47.36667; 65.48333. In reality, the launch site was near Tyuratam at 45°55′12.72″N 63°20′32.32″E﻿ / ﻿45.9202000°N 63.3423111°E﻿ / 45.9202000; 63.3423111, ၂၅၀ km (၁၆၀ mi) to the south west of "Baykonur". They did this to try to keep the location of the Space Center a secret. :284 In 1995, Russian and Kazakh officials renamed Tyuratam Baikonur. Commemorative monument, Vostok-1 landing site near Engels, Russia. Vostok, the lead ship of Faddey Bellingshausen, who discovered Antarctica during the First Russian Antarctic Expedition. Some sources connect the name Vostok 1 to Bellingshausen's ship. ↑ Burgess and Hall, p.151. During a post-flight press conference on April 15, Alexander Nesmeyanov claimed that Gagarin took a sleeping pill. Also, Siddiqi, p.273, claims that they were both asleep at 9:30 pm when Korolev came to visit them, but Burgess and Hall, p.151, says Korolev spoke with them at this time. ↑ Siddiqi describes is as a "tranquilizer pill", while Hall and Shayler describe it as a "cardiac pill". ↑ UPI Radio – 1961 Year In Review. ↑ ၂၉.၀ ၂၉.၁ ၂၉.၂ ၂၉.၃ ၂၉.၄ ၂၉.၅ ၂၉.၆ ၂၉.၇ ၂၉.၈ ၂၉.၉ "Opinion of the Week: At Home and Abroad," New York Times p. E11 (April 16, 1961). Quotes of reactions from many US and international sources. ↑ ၃၀.၀ ၃၀.၁ ၃၀.၂ ၃၀.၃ "Man in Space", New York Times p. E1 (April 16, 1961).